Someplace Strange has been nominated for a Liebster Award by Lena at Foray into Fashion. Thank you so much! Someplace Strange can now be described as "an award winning blog". I am an "award winning blogger". If a point is stretched slightly. Marketing is partly about spin! “Liebster” comes from Germany and means dearest, sweetest, kindest, nicest, beloved, lovely, kind, pleasant, valued, cute, endearing, welcome, sweetheart. 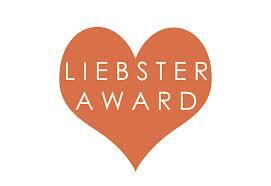 Liebsters are a great way for bloggers to celebrate and promote others. They are awarded by bloggers to bloggers and are a chain letter. Accepting the award means passing it on. Answer the 10 questions given by the nominator. Nominate and link with up to 10 bloggers (with less than 200 followers). Notify all the bloggers you’ve nominated. Create 10 new questions for your nominees to answer and write your own post about it. My husband's uncle signed Rodolf Hess' death certificate. I love Apple products. They're so beautiful and functional. My favourite TV programme is Doctor Who. Classic or reboot. I love cooking but would never go on something like MasterChef. Too scary! My favourite animal is the hippo. They wake up grumpy, grump they're way through the day and grump themselves to sleep. I can't swim very well either. My favourite band is Depeche Mode. They were my first proper concert. My second proper concert was U2's Joshua Tree tour. What is the worst thing about blogging? Finding time to do it! Who would you invite to your ideal dinner party and why? Our friends Laura, Peter and Daz. They live far away and we don't see them often enough. Name one thing on your ‘Bucket List’. Going on safari in Africa to see the wild animals in their natural habitat. Who is your favourite author? Just one?! Either Dianne Whynne Jones or Neil Gaimen. What is your day job and would you give it up to write full-time if offered the opportunity? I work as a researcher in a financial services company. I wouldn't give it up to write full time. I like being a hobby blogger. What do you think is the most important quality for a blogger (obviously other than literacy)? Being part of the wider blogging community and making others welcome. How do you relax at the end of the day? Reading, blogging and watching TV. Who would you love to write a biography about? Not sure. I'd want to write about someone I admired and would be heartbroken if they turned out to be a terrible person. Who would play you in a film of your life? Sophie Thompson or similar. Tell something about yourself that no one else knows. No. It's not a secret if I tell you. Please would the owners of the lovely blogs mentioned step forward, accept their award and then go pay it forward. Enjoy! What's the weirdest thing that's ever happened to you? Three things you can't live without. This has been great fun. It's a great opportunity to meet new people, hopefully make new friends and find new blogs to read. And share the love! Thanks again to Lena for the nomination! It's really encouraged me. Thank you for congratulating me and for the lovely comment. They don't know what they're missing. I like elephants and red pandas too. Congrats on your 'Award Winning Blog'! Thanks for joining us at #MidLifeLuv, we're so glad to have you. Thank you so so so much for nominating :)! As we've already chatted on my blog you know how happy I get about these things :) I told you i would be doing the answering, but I'm actually thinking about doing a post with it too... We'll see we'l see :) Please be patient with me! Are you going to learn how to drive? Or you don't need it? Congrats on the nomination. Some great answers here. Sorry the comment for last weeks #BinkyLinky is a little late, we were on holiday and only got back late last night! I hope you had a wonderful time and will soon be all caught up. Thank you for hosting each week.